VPSVille provides you with a web-based control panel software developed in-house to provide access that will make you feel as if your server is located right next to you. 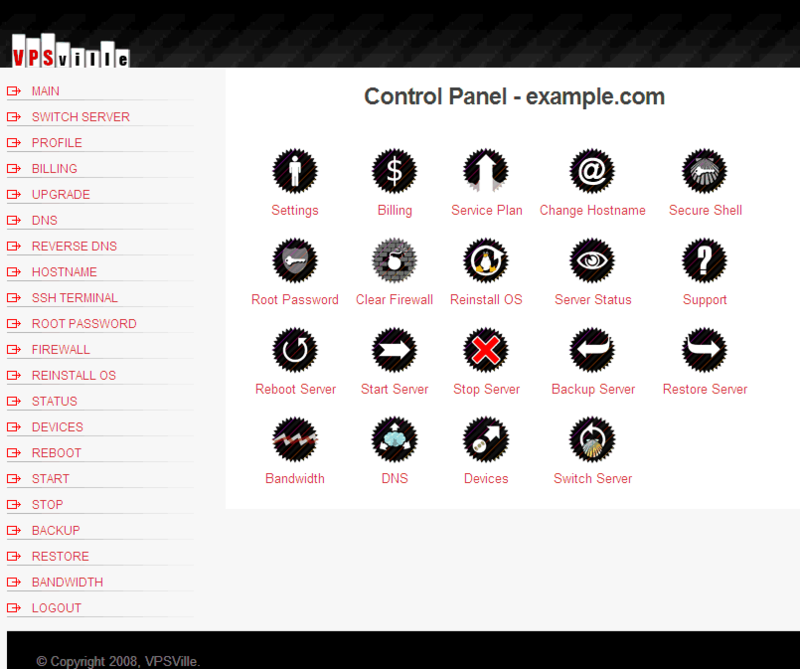 Note: if you are looking for a control panel that will control the software on your server, such as email, dns, apache etc. then we recommend our you take a look at our cPanel or HIB Plans. Ability to Boot up, Shutdown, and Reboot your server. Reinstall your servers operating system with any of our provided images in only a few minutes. Upgrade or downgrade your server on the fly. View server limits and bandwidth statistics. Web access to your server via SSH. Configure your Hostname and rDNS. Clear any iptables firewall rules in case of emergency lock-out.